Oops, the NY Times claimed Richard wasn’t found in Leicester, but in London….! Even the New York Times gets it wrong! Apparently an earlier version of a book review had Richard being found in London, not Leicester. Someone advised them, and the error was corrected. Anyway, to read the whole review of A BRIEF HISTORY OF EVERYONE WHO EVER LIVED: The Human Story Retold Through Our Genes by Adam Rutherford, go here. A book to be approached with caution if one supports Richard III…. The link below is to a review of Mike Pitts ‘Digging for Richard III – the Search for the Lost King’. I confess up front to not having read the book itself, and my reason is simple. The review tells me how Richard himself is referred to in the book. The usual Shakespearean invention. I will not pay money in order to be angered. For all I know it may be excellent in every other respect, but once a Ricardian, always a Ricardian. This lady’s not for turning. I leave it to others to make up their own minds. Who else is under that car park….? What can I say? Richard was buried in Leicester, which is apparently part of Reading. Or is it the other way around? Whatever, Henry I was there too! Were they close enough to commiserate? Perhaps archaeologists should dig a little deeper where they found Richard and Henry . . . because it’s likely King Arthur is also down there somewhere! At least they didn’t ask why Windsor Castle was built so close to Heathrow. Has Henry I been located? A heat map produced by GPR appears to show evidence of graves close to Reading Abbey’s high altar, corresponding almost exactly to Richard III’s location in the Leicester Greyfriars, as this post shows. The site, which is presently and inevitably a car park, was once occupied by the gaol Oscar Wilde made famous, see also here . This Glasgow Herald article illustrates how historian Sheila Pitcairn wishes to search Dunfermline Abbey and identify Malcolm III and his family. Robert I (le Brus) can easily be found there already. The widowed Malcolm III married (St.) Margaret of Wessex, great-niece of Edward the Confessor and granddaughter of Edmund Ironside, in about 1070, allowing Anglo-Saxon royal blood to pass into the Scottish monarchy and then the English Plantagenets via their daughter Edith who married Henry I. St. Margaret is also among the lost members of the House of Dunkeld thought to be buried at the Abbey, together with their offspring: Edward (killed with Malcolm fighting the Normans at Alnwick), Edmund (a co-ruler) and Ethelred (Abbot of Dunkeld), Edgar, Alexander I and David I (three of the kings who reigned after Malcolm) and their grandson Malcolm IV (David I’s son). Exhumers would also expect to find Donald III (Malcolm III’s brother) and Alexander I’s wife Sybilla although some parts of Malcolm and St. Margaret may have been in Edinburgh Castle, the Scots College at Douai in France or the Escorial in Madrid. They may have been lost due to later events. An interactive 3D tour of Richard’s place in that car park…. The Ricardian news today is in a great many national newspapers, and concerns a 3D interactive exploration of Richard’s resting place – the car park, not the cathedral. I don’t know how many of you would wish to see this, but I don’t, because it’s too sad to be reminded of what happened to him. At the same time, I should not forget that if it were not for this amazing discovery, we would not have him back with us again today. I wonder how many listened to this programme a week or two ago? 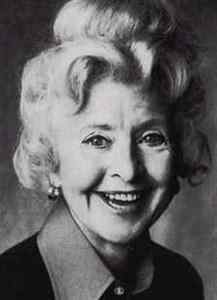 It was about the late diminutive Scottish actress Molly Weir who, between 1978 and 1984, played “Hazel McWitch” in the children’s comedy Rentaghost – you could tell it was a children’s comedy because one of the main characters died in the first few minutes of the opening episode, after a motorcycle accident. 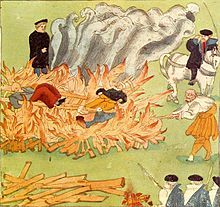 Had she existed, McWitch, being Scottish, is likely to have been a victim of the campaign against witchcraft begun by James VI and to have been one of about 1700 burned between 1590 and 1722. Most were strangled before being burned, although William Tyndale could testify that this was not always effective. Much angst and verbiage has been vented and spilt lately on the subject of exhumation of bodies, particularly those of royal lineage. I don’t claim to be an archeologist, or an expert in the ethics of exhumation, but I stand in puzzled wonderment at the continued resistance to any proposed opening of the infamous urns at Westminster Abbey. Those urns purport to hold the skeletons of the “Princes in the Tower” – Edward V and his brother, Richard of Shrewsbury, Duke of York. Well, they do more than just purport – they are actually designated as such in the Minster. I wonder how many tourists actually believe they are laying eyes on those tender golden-haired boys they had seen smothered with a pillow in Laurence Olivier’s movie masterpiece “Richard III”. By odd coincidence, as I was making my Internet meanderings lately, I came across a blog that brought light to an earlier exhumation of a Yorkist prince: Edmund of Langley, first Duke of York. It turns out that he was exhumed not once, but twice! First, in 1574 and then again, in 1877, at Kings Langley in Hertfordshire. Kings Langley, of course, was the original resting place of Richard II following his (ahem) “premature death by nutritional deficits” at Pontefract Castle in 1400. Perhaps in a fit of remorse or true piety, Henry V had the remains exhumed and translated to Westminster Abbey. 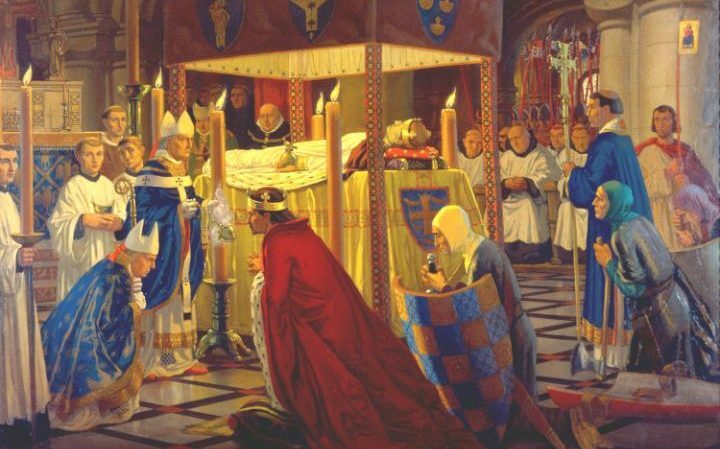 Henry V did not think to accord the same honor to his great-uncle, Edmund of Langley, whose body was laid to rest at Kings Langley in 1402, next to that of his first wife. Of course, one would not expect the scion of the House of Lancaster to elevate the remains of a prince of a rival house, notwithstanding that Edmund was of the blood royal and his ancestor. Westminster Abbey was for anointed kings and queens, and Edmund didn’t make the cut. What happened next is, however, of some interest. Originally interred in the Church of the Dominican Friary at Kings Langley, the remains of the Duke and his wife were moved around the year 1574. It appears that Elizabeth I had revoked several financial grants that had been given to the friary by Queen Mary I and King Edward VI, and it fell on hard times and ruin as a result; perhaps it was dissolved. So, the Duke’s tomb was opened up and its contents re-interred at All Saint’s. “I examined three skeletons at King’s Langley. Of these one was the skeleton of a powerful man, considerably past the middle period of life; a second was the skeleton of a woman, as far as I could judge, between thirty-five and forty years of age; the third had belonged to a younger woman, whose age, however, could not have been very far from thirty. The bones of the first two had got somewhat intermingled; those of the third had been kept safely apart from intermixture in a leaden coffin. “The skull belonging to the male skeleton had a sloping forehead. The chin and lower jaw were powerfully developed. The front teeth were small in size and crammed together, and many of the back teeth lost. Still the retention of the front teeth and the good development of the lower jaw and chin, coupled with the length and breadth of the facial region, must have given a commanding expression to the old man who owned this skull. “The age was somewhere between fifty-eight and sixty-five. The crippled condition of his later years must have formed a touching contrast to the strength and vigor which he certainly possessed. In the lower jaw, three molars had been lost during life, two on one side and one on the other, and one pre-molar was carious. In the upper jaw the molars had been lost during life, and two pre-molars were carious. A piece of coarse textile fabric, with some hair of a greyish-red color adhering to it, was found with the skull. He was from 5′ 5″ to 5′ 7” in height. “The second skeleton, which was more or less mixed up with the first, belonged to a woman from 4 feet 6 inches to 4 feet 8 inches in stature, and between thirty-five and forty-five years of age. The wisdom teeth were all present; of those in the upper jaw, the one on the right side was apparently only just through the socket; whilst that on the other (left) side had a large cavity. The two lower jaw wisdom teeth were little worn. The right lower jaw canine presented the rare anomaly of a bifid root. “It has struck me as possible that these remains may be those of Anne Mortimer, daughter of Roger Mortimer, Earl of March, first wife of Richard of Coningsburgh. This is, however, mere conjecture.” — John Evans (1881). XIV, Edmund of Langley and his Tomb, Archaeologia, 46, pp. 297-328. Contemporary historians and genealogists agree with Evans’ view that the skeleton in the leaden coffin is Anne Mortimer’s. She was the heir general in her issue of the Crown of England, and transmitted the right to the Crown to her grandson, Edward IV. I keep thinking: what if Dr. Rolleston had not been given permission to examine the bodies in Edmund’s tomb in 1877? Would the body of Anne Mortimer have been found? Indeed, would the third skeleton have ever been noted? How do we resolve the conflicting search for historical truth versus the need to accord respect to human remains? I do not have the answers, but somewhere in my gut, I feel the search for truth must win out.